Back in January 2017, we reviewed iZotope’s Neutron, an innovative plug-in that not only includes a wide range of processing tools, but a facility called Track Assistant, which automatically analyses source tracks and suggests appropriate settings. The version 2 update under review here not only introduces an improved Track Assisant with expanded functionality, but also debuts new features aimed at speeding up your mixing still further. Simultaneously, iZotope also launched version 8 of their long-established Ozone mastering suite. This incorporates numerous new features and improvements, perhaps the most interesting of which is the ability to communicate with Neutron 2, opening up the possibility of addressing mastering EQ-related issues within a mix. Since Ozone 7 was also covered in some depth relatively recently, in SOS February 2016, I’m going to concentrate here on the improvements and new features found in the Advanced versions of both programs, some of which don’t appear in their lower-cost Standard and Elements variants. Tracks that don’t require Neutron processing can still make their contribution to its analysis of other tracks, thanks to the new Mix Tap plug-in.Designed to ease and enhance your mixing process, rather than to automate it, Neutron 2 aims to provides starting points on which you can build, alongside tools intended to assist you in analysing and correcting issues in your mix and in its component tracks. An important feature of Neutron 2 is that all of its instances are ‘aware’ of, and can communicate with, all of the others. The ideal starting point for a Neutron 2-assisted mix is therefore to instantiate the plug-in on every track, at the end of any existing plug-in chains. In case that tips your CPU load over the edge, Neutron 2 also gives you the option of inserting a new lightweight Mix Tap plug-in. Mix Tap features Neutron 2’s high-pass filter and the new delay offset, polarity invert, sum-to-mono and L/R channel swap functions, and can communicate with instances of Neutron 2 on other tracks. The key Neutron analysis feature is Track Assistant, which automatically creates individualised starting point ‘presets’ for each track that Neutron 2 is instantiated on. To operate, Track Assistant needs to ‘hear’ around 5-10 seconds of audio from the track, during which time Neutron 2’s combination of “audio intelligence” and machine learning techniques identifies the source as instrument or vocal, and analyses, selects and configures one of its “unique and varied smart templates”. Having selected a template, this new version of Track Assistant activates and intelligently modifies the required processing blocks within it. This process encompasses placing them in the optimum order, selecting single-band or multiband processing, calculating and creating an EQ curve, selecting the styles of compression and setting their parameters, setting the parameters of the new multiband gate and transient shaper, selecting and tuning the blend of Exciter algorithms, and adding Neutrino’s spectral shaping in order to improve focus and clarity. The new version of Neutron’s Track Assistant offers more intelligent and more varied customisation of presets to suit sources. Although my colleague Mike Senior was slightly underwhelmed by the original version, I rather liked this new and improved Track Assistant. The incorporation of advances in machine learning and intelligent audio processing, together with the increased number of presets and the improved instrument/dialogue/vocal detection, appear to have increased Neutron 2’s ability to find a good match with the character of the audio being analysed. Track Assistant’s new abilities — setting the ratio and attack and release times in single or multiband Compressors, setting the amount of drive in the Exciter, and setting the threshold in the Transient Shaper — were impressive in operation, as was the new multiband Gate. I was particularly taken by the new gate’s Hysteresis function, which applies a second threshold for closing 2dB below the opening threshold, making it more efficient and natural cleaning up low-level bleeds. Although Track Assistant’s EQ choices weren’t necessarily those that I might have made, they were always interesting, whilst the dynamics settings usually turned out to be good places to start from. Overall, I was quite happy to let Track Assistant set up starting points and to go from there, using the Undo History to step back if I made things worse rather than better. However, despite my enthusiasm, the basic point behind Mike Senior’s discomfort still stands: if the choices that Neutron 2 makes do not match your taste, then you may be better advised either to manually audition and select one of Neutron 2’s 500 or so well-indexed presets, or to create your own EQ/dynamics starting point in the traditional manner. Being the core of the Neutron 2 plug-in, Track Assistant is inseparable from it. However, the Equaliser — which includes the Masking Meter and a new Soft Saturation function that introduces non-linear harmonic distortion — Compressor, Exciter and Transient Shaper modules are all made available as individual plug-ins. 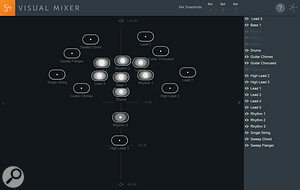 Visual Mixer provides a focal point from which the pan, width and level of multiple Neutron instances can be adjusted.The Neutron 2 suite also incorporates three new separate plug-ins. Mix Tap has already been mentioned, while Visual Mixer and Tonal Balance Control are both intended for insertion into your DAW’s master bus. Although no audio actually passes through it, Visual Mixer is intended to sit as the last plug-in on the mix bus. Its 2D virtual soundfield graphic interface not only displays pan, volume and stereo width information for every track with Neutron 2 and/or Mix Tap instantiated on it, but also allows you to adjust these parameters by dragging and dropping. Since the communication between Visual Mixer and Neutron 2 or Mix Tap is bi-directional, changes made in one are reflected in the other. Simple level metering is provided courtesy of a white dot in the centre of each track graphic, which expands and contracts to give you a visual indication of the balance across the soundfield. Three mix snapshots can be saved, allowing a quick and easy A/B check on the effects of changing a mix without losing the original. Tonal Balance Control (shown in the main header screenshot of this review), meanwhile, is a visual equalisation analysis tool that is intended to ensure that your mix translates well across different music distribution systems and listening environments. This is achieved by allowing you to compare the audio frequency energy distribution in your mix against one of three composite tonal balance ‘target curves’: Orchestral, Modern and Bass Heavy. Created by analysing a multitude of tracks in different genres and styles of music, these curves display the range of audio spectrum energy distribution found in those broad genre groupings. Tonal Balance Control can also analyse single or multiple tracks whose spectral energy profiles you wish to emulate, producing custom target curves that you can save and use. Once selected, these targets can be displayed in one of two views. Broad provides four horizontal bands called Low, Low-Mid, High-Mid and High, with crossover points at 250Hz, 2kHz and 8kHz, while Fine shows a broad, somewhat trunk-like curve that covers the full 20Hz-20kHz frequency range. In both views, energy distribution in your mix is shown as a white line that, ideally, should lie inside the boundaries of the target areas. A separate Crest Factor Meter displays an analysis of the Low band that indicates the amount of compression in the low-frequency content of your mix, ranging from ‘too little’ to ‘too much’. To speed up the identification of problem areas, Tonal Balance Control allows you to solo a narrow band of your mix’s audio spectrum and to sweep that band across an offending area. Since Tonal Balance Control communicates bi-directionally with the equalisers within all instances of Neutron 2 and (as we’ll come to) of Ozone 8, you can adjust the EQ of individual tracks to improve the overall spectral energy balance without leaving the plug-in during the mixing and/or mastering process. Neutron 2 is complex, and this overview of the main aspects of its new features can only hint at its power. You’ll find much more detail, including comprehensive online help documentation and a range of tuition videos, on iZotope’s web site. For me, Neutron 2’s automatically generated starting points, lightly modified in light of my own preferences, generally resulted in mixes that I was happy with. Interestingly, Neutron 2 did come up with some proposals that I would not necessarily have reached on my own, and those usually turned out to be unexpected learning opportunities. Analysing the modules and parameter settings that Neutron 2 chose, whether I liked them or not, was an experience that I would recommend to anyone looking to improve their mixing skills. Neutron 2 won’t turn you into a genius mix engineer, but it can help guide you towards making better mix decisions, especially if you take the time to analyse and understand what you do or don’t like about its choices. As Neutron 2 is to mixing, Ozone 8 is to mastering, hence the debut of Master Assistant. Like iZotope’s Track Assistant, this incorporates assistive technology, machine learning and artificial intelligence to deliver a suggested starting point tailored to the track being mastered. Other new features in Ozone 8 are Tonal Balance Control (which we’ve already taken a look at), Track Referencing and the Spectral Shaper module/plug-in. Ozone 8’s operation is based around target curves, and its online help documentation sheds some light on the way these were created. Initially, humans grouped a wide variety of music into 10 genres, which were analysed to produce 10 target curves representing the typical spectral characteristics of each genre. The majority of these could be further grouped into the three broad categories that make up Tonal Balance Control’s target curves. In Streaming mode, Ozone’s Maximizer will target a loudness of -14 LUFS that is appropriate for streaming services. Master Assistant offers three target types called Streaming, CD or Reference. Streaming sets a default Maximizer threshold to deliver the target loudness of -14LUFS that is typical of online streaming platforms. The CD setting interacts with the Maximizer’s Intensity parameter to produce the loudest possible output, while Reference allows you to use a target curve derived directly from a track of your choice loaded in Ozone 8’s new Track Referencing module. To operate, Master Assistant needs to hear approximately 30 seconds of, ideally, the loudest part of your mix. Unless you have selected Reference as a target, a neural net classifier determines how similar your mix’s spectral content is to each of the 10 preset target curves and assigns a percentage of similarity to each one. 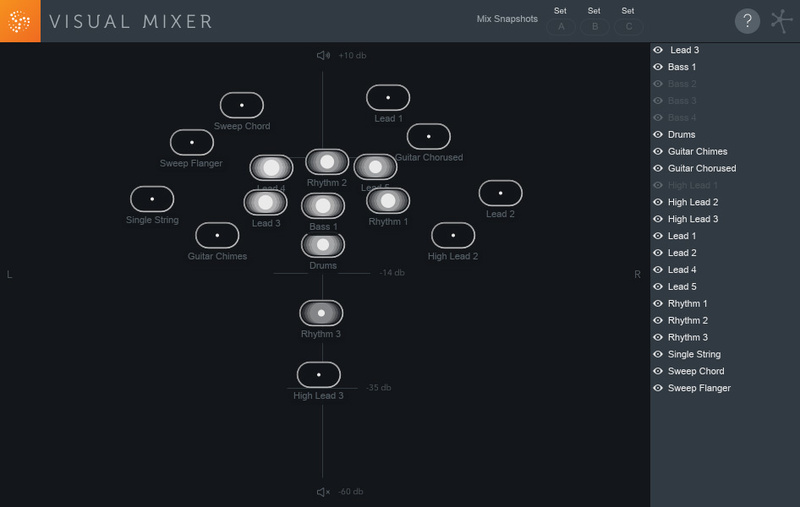 Based on those percentages, Master Assistant then creates a unique target curve for your mix and also loads a preset based on the genre classification with the highest resemblance to your mix. Loading a preset — in which the module order is fixed — sets initial parameters that have not been learned from incoming audio, such as Maximizer IRC mode, Dynamics attack and release times, and so on. Master Assistant then sets the preset’s Equaliser module to adjust the mix’s spectral balance to that of the target curve, analyses the dynamic range and configures the Dynamics module to control it, sets the Maximizer’s Ceiling value and adjusts its Threshold to hit the target loudness, analyses the Maximizer’s frequency-dependent gain reductions and, finally, sets the Dynamic EQ to reduce any potential distortion in the Maximizer. Any changes made to this starting point are recorded in the Undo History window, allowing you to step back if necessary. The new Reference Panel in Ozone 8 Standard and Advanced allows you to import up to 10 audio tracks as references, to A/B between your mix and a selected reference track and, using the overlaid spectral metering, to visualise the differences between the two. Usefully, when a reference track is loaded, machine learning is employed to indicate the boundaries of similar-sounding sections, allowing those to be auditioned and individually looped if necessary. To help maintain consistency, imported reference tracks are available to all mixes within a project. A new Track Reference feature in Ozone 8 lets you import your own reference material and helps you to make meaningful comparisons with your own track. Also new is Spectral Shaper, a dynamics processor that delivers high-resolution attenuation of problematic frequencies within a user-defined portion of the audio frequency spectrum. Its variable-mode (Light, Medium and Heavy), threshold, attack, release and tone controls enable you to zero in on a narrow band of frequencies in order to deal with issues such as percussion transients, harsh vocals and other bright, overly forward mix elements without affecting the rest of the mix. In addition to its corrective capabilities, Spectral Shaper can also be used as a creative tool to shape and sculpt tone and transient response across either the full mix bandwidth or a specific area within it. Having identified the frequency area to be worked on, selecting it is simply a matter of dragging the upper and lower cutoff handles to enclose that area. The module’s Solo function lets you audition the audio that is going to be affected before it is processed and the Listen function allows you to hear the post-process audio. Spectral Shaper’s meters display either the selected frequency band or a scrolling gain reduction trace, overlaid on a waveform trace of the incoming audio, to help you set the threshold level and attack and release times. To my ears, Ozone 8 did an extremely impressive job of creating starting points for my mastering endeavours. Although not every initial parameter that Ozone 2 suggested for its EQ, Dynamics and Maximizer modules worked for me, the issues that I had tended to be more artistic than technical. As with Neutron 2, taking the time to analyse what I did or didn’t like and developing corrections to these basic modules was an interesting and educational experience. Every Ozone 8 module has something interesting to offer, and all are well worth taking time to explore in detail, especially those that are available as plug-ins. As a relatively recent convert to the joys of Mid/Sides mastering techniques, the built-in M/S processing in the majority of Ozone 8’s modules was a real bonus, as was the ability to automate their parameters within my DAW. Another automation feature that I really liked was the Opacity control in the plug-in version, which allows you to see ‘through’ the plug-in window to monitor track and automation data whilst also being able to see Ozone 8’s meters and controls. Although Ozone 8 will no more turn you into a mastering engineer than will Neutron 2 make you Chris Lord‑Alge, it will give you a starting point that you can build on, and a set of tools that you can use to develop and enhance both your mastering skills and your masters. Since more and more recording, mixing, post-production and mastering engineers appear to be utilising personalised, pre-determined processing templates built up of plug-ins from various manufacturers, it would appear that both Neutron 2 and Ozone 8 are potentially riding on the crest of a wave. As a pairing, these two innovative programs provide a complete set of mixing and mastering processors, but make it possible to include third-party plug-in chains and even hardware outboard into the process. Perhaps just as importantly, their ability to analyse individual tracks and finished mixes and to produce suggested starting points for mixing and mastering has the potential to not only help speed up the creative process, but also to provide educational opportunities for less experienced engineers. Compared to the cost of the hardware processors required to build a mixing and/or mastering chain of comparable quality and facility, the asking prices for Neutron 2 and Ozone 8 — either individually or as a bundle — have to be viewed as a bit of a bargain. If you’re a bit unsure as to whether or not these two programs will work for you, iZotope offer a 10-day trial that I’d also encourage anyone interested in mixing and mastering to download and experiment with. If nothing else, you’re bound to learn something from the experience. Improvements abound in the functionality of Ozone 7 components carried over to Ozone 8, all of which are available as individual plug-ins in the Advanced version. The Maximizer, which utilises iZotope’s proprietary Intelligent Release Control (IRC) limiter technology to allow you to boost the level of a mix without destroying its dynamics and clarity, gains three new functions. Transient/Sustain Stereo Independence enables the Maximizer to detect and separate the transient and sustain information in the left and right signals and to process those independently. Learn Threshold automatically adjusts the Maximizer’s threshold so that the output reaches the maximum output level set in the Ceiling function (-1dBFS for streaming and -0.3dBFS for CD and Reference). A Threshold and Ceiling Link function enables you to audition the effects of your processing by allowing you to decrease the threshold level without boosting the perceived level of your mix. IRC itself has been upgraded, with improved, “acoustically spaced”, multiband limiting and a new LL mode offering lower processing latency. The stereo, multiband Imager (a single, full-band version of which is available as a free download) gains a Link Bands feature. Once you’ve set the stereo width across its four bands, this links the Width sliders so that they move with, and in relation to, each other. Whilst the Equaliser, Vintage and Dynamic EQ modules are seemingly unchanged, the multiband Exciter now gains the ability to implement any one of its six modes (Warm, Retro, Tape, Tube, Triode, Dual Triode) separately on each of its four bands, and there are minor changes in the dynamics, where the single-band, feedback Vintage Compressor has had its ballistics and sound quality improved. The Vintage Tape module, inspired by the old Studer A810 two-track, has been given a new additional 7.5ips non-linear saturation mode that adds emphasis in the low mid-range setting alongside its existing 15ips and 30ips emulations. Communication between Neutron 2 and Ozone 8 creates an integrated mixing and mastering environment. Track and Master Assistant’s suggested starting points are usually useful, occasionally thought-provoking, and always educational. Tonal Balance Control is a unique way of compensating for less-than-ideal monitoring and listening environments. Availability of plug-in versions of modules adds to the programs’ flexibility. Analysis can be based on user reference sources. None, as long as you buy into the concept and are willing to learn. The new versions of Neutron and Ozone have improved both programs’ abilities to match more closely their suggested starting points to the tracks being processed, while the intercommunication between both programs and their individual plug‑in components gives you the ability to work seamlessly in an integrated mixing and mastering environment. O8N2 bundle £629; Ozone 8 Advanced & Neutron 2 Advanced £449 each. Prices include VAT. O8N2 bundle $699; Ozone 8 Advanced & Neutron 2 Advanced $499 each.